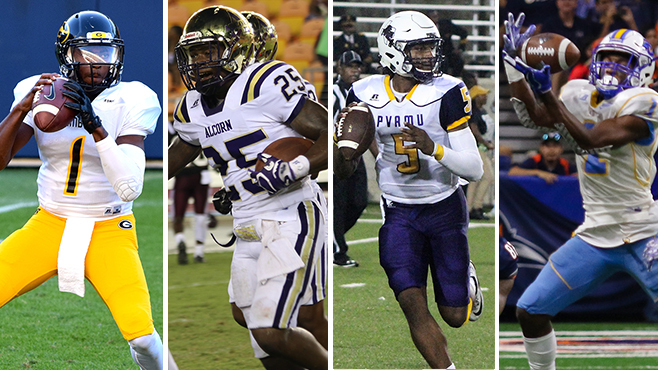 BIRMINGHAM, Ala. – Grambling State senior quarterback Devante Kincade, Alcorn State junior defensive back Isiah Thomas, Southern senior defensive back/return specialist Danny Johnson and Prairie View A&M junior transfer quarterback Lavell McCullers were all named the Southwestern Athletic Conference Football Players of the Week in week five of the season for their outstanding play. Kincade came off the bench to lift Grambling State to a 31-20 victory over Clark Atlanta in the 20th annual Chicago Football Classic. He was 19-of-31 passing for 278 yards and three touchdowns. He also rushed seven times for 31 yards. For his big offensive production, Kincade was named the Chicago Football Classic Offensive Most Valuable Player. Thomas turned in a career game for the Braves in their 24-17 victory over Texas Southern. Thomas registered a career-high 13 tackles, including three tackles for a loss, and also an interception. He more than tripled his previous career-high of four tackles last weekend against Southern. Thomas was the only Brave with double-figure tackles in the game. For the third consecutive week, Danny Johnson produced a highlight reel type of play with a returned punt 68 yards for a touchdown in Southern’s 31-14 victory over Fort Valley State. McCullers totaled 258 yards in a 38-9 win against Jackson State including season highs in passing yards (190) and touchdown passes (two) and rushed for 68 yards on eight carries.